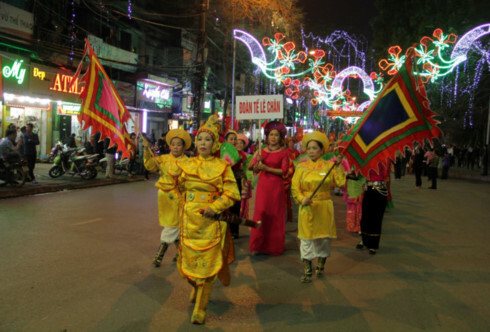 A festival is held annually in the northern port city of Hai Phong on the 8th day of the second lunar month in memory of female general Le Chan, who is credited with having founded the city nearly 2000 years ago. The palanquin procession is the most exciting part of the Le Chan festival. She also mobilized the local people to join the Trung Sisters, who led an uprising against Han Chinese invaders in 40 AD. In addition to traditional rituals in honor of Le Chan, this year’s festival featured a wide range of cultural and artistic activities, all taking place in the square in central Hai Phong City that bears her name. Local residents and visitors from other localities attended the festival to pay their respects to the female general, who is considered the guardian of Hai Phong. General Le Chan is believed to have established An Bien village, the original name of Hai Phong. A procession involving more than 1,000 people wearing traditional costumes walked from Nghe Temple and the An Bien Shrine to the square where Le Chan’s statue stands. The 3-day festival included rural market sessions, martial arts performances, and folk games. "I think the festival was very well-organized, especially the reenactment of Ven village’s rural market session. I took my grandchildren to the festival to help them learn more about Hai Phong’s traditions," said Nguyen Thi Mao of Hai Phong City. "This year’s festival was very exciting, just like the previous ones. The local people were very eager to engage in all the festival’s sports and literary competitions," said Nguyen Quang Khai, a resident of Hai Phong. The festival in honor of General Le Chan was officially recognized as a national intangible cultural heritage by the Ministry of Culture, Sports, and Tourism in 2011. Last year, the festival was promoted to a city-wide event. "The palanquin procession was the most exciting part of the festival. It was well-prepared and helped warm up the event’s atmosphere and cheer up festival goers. We also invited 20 delegations from neighboring districts and cities to join the festival as part of our efforts to promote local tourism," said Pham Tien Du, Chairman of Le Chan district’s People’s Committee. Two further aims of the colorful Le Chan festival are to introduce local food delicacies and spiritual tourism destinations to a wider public.